TEMECULA, CA--(Marketwired - May 19, 2016) - When Aristocrat unleashed the original The Walking Dead™ Slot Game, the gaming industry named it "Slot Product of the Year," and players herded to the game, naming it the #1 best penny slot, among others. Now the highly anticipated follow up game, The Walking Dead II™ Slot Game, is making its world premiere today at Pechanga Resort & Casino. "We are thrilled to host the world premiere of this exciting new game," said Alex Rodriguez, Vice President of Slot Operations at Pechanga. "Pechanga is known for our distinctive events, and we are excited to be the first casino in the world to bring The Walking Dead II Slot Game to our players." The new The Walking Dead II Slot Game builds on the momentum of the TV series and the original game, and ups the ante with all-new content that is more exciting than ever. 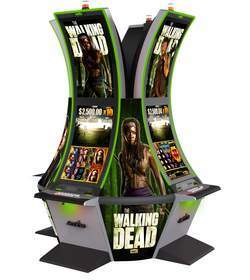 The Walking Dead II is housed in the award-winning Arc Double™ cabinet, providing an engrossing player experience. Heavily themed to the action in the show's season three, this new game includes features like a random Michonne Attack bonus, Reel Growth for up to 300 lines, and Wild Horde multipliers. Other bonus features include Governor Jackpot Bonus and Governor Free Games. Pechanga Resort & Casino offers one of the largest and most expansive resort/casino experiences anywhere in the United States. Voted the number one casino in the country by USA TODAY and rated a Four Diamond property by AAA since 2002, Pechanga Resort & Casino provides an unparalleled getaway. Offering more than 3,000 of the hottest slots, table games, world-class entertainment, 517 hotel rooms, dining, spa and golf at Journey at Pechanga, Pechanga Resort & Casino features a destination that meets and exceeds the needs of its guests and the community. Pechanga Resort & Casino is owned and operated by the Pechanga Band of Luiseño Indians. For more information, call toll free (877) 711-2946 or visit www.Pechanga.com. Follow Pechanga Resort & Casino on Facebook - facebook.com/pechanga and on Twitter @PechangaCasino. Aristocrat's The Walking Dead II(TM) Slot Game makes its world premiere today at Pechanga Resort & Casino in Temecula, Calif.